Most people can agree that picking weeds is not a whole lot of fun. [Dave] was not a big fan of sitting out in the heat toiling over his lawn, so he did the only rational thing and built a robot to do it for him. Nuntius, the Garden Avenger, is a remote controlled robot that [Dave] can use to pick weeds from the comfort of his couch. The robot is controlled by a Propeller microcontroller, taking its commands wirelessly via a pair of XBee modules. Nuntius’ controller is pretty intuitive, consisting of a 5-axis arm complete with a gripper that [Dave] can articulate in any number of directions. 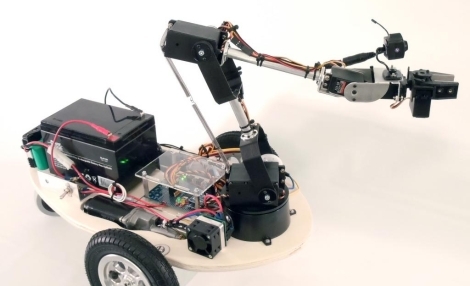 His motions cause the robot’s arm to move in sync, and driving Nuntius is as easy as holding down a button and moving the controls in the desired direction. [Dave] can monitor what Nuntius is doing via a wireless camera he has installed on the robot’s arm, allowing him to sit back and relax indoors while the robot handles the hard work. Keep reading to see a short video demo of Nuntius in action. you just posted this project on monday. You people just posted about that *this* *week*. Seriously. haha, well, it happens. I think we’ll probably delete this one. Pierre-Loup M. has added a new log for Darkroom lamp for wet plate collodion. Giuseppe Romano liked pcbtc (GaN edition). karthik ram liked SierrOS - Cardiopulmonary Resuscitation Device. karthik ram wrote a comment on Project HomeShot. karthik ram wrote a comment on SnapOnAir LORA/GSM phone.